I was born in the south of Thailand. When I was young, I played under the shade of a huge tree, whose fruits would prodigiously drop to the ground at certain times of the year. I didn't know then, but I know now that the tree was the soapberry tree, Latin name sapindus. Now, many years later, I feel grateful to have that memory association to what is an incredible tree and its fruits, which we call soap nuts. Soapnuts are dried fruits of the soapberry tree which have been in use for thousands of years in India and elsewhere to wash the body, the hair, and the whole home. The ancients sure knew a lot of what we are just scientifically finding out today. Soapberries contain naturally occurring saponins, which detach dirty from fibres, hence they do a really good job cleaning without chemicals. The ancients were using 100% natural soap nuts to effectively clean — they had no need for the modern cleaners of today that are made in a lab. Are You Concerned About the Unpronounceable Chemicals In Your Cleaners? I am! Even the so-called "earth-friendly" cleaners have chemical-sounding agents in them that I'm suspicious of. 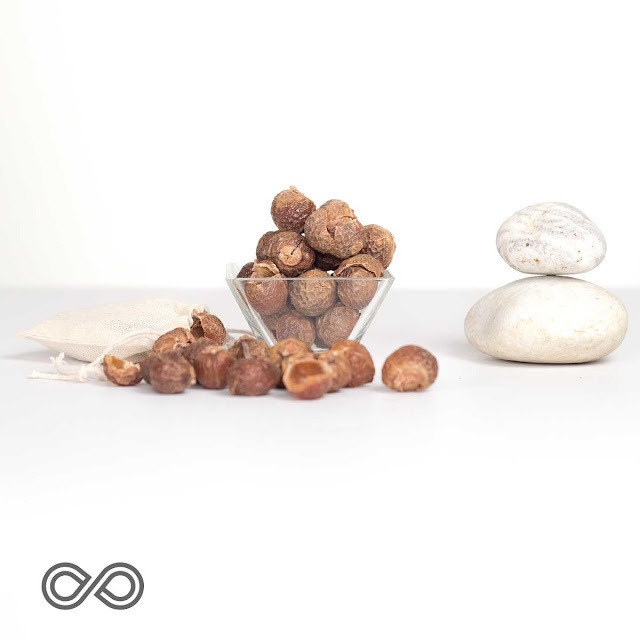 Nothing comes close to soap nuts in terms of biodegradability and hypoallergenic qualities. Soapnuts are 100% biodegradable. After a couple of uses, soap nuts can be safely tossed in the compost bin and they break down into beautiful humus, just like any other plant materials you put in there. And our soap nuts are 100% certified organic. Even better, right? Check out our website for recipes on how to turn this one amazing 100% natural and organic laundry detergent substitute, soap substitute, shampoo substitute, and household cleaner substitute. Organic soap nuts are incredibly economical. You'll save money and save the environment at the same time. No more worrying about what happens to detergents once it's discarded from your washing machine into the waterways. Have you used soap nuts before? Do you have tips or recipes for certain cleaning jobs that we can learn from? Do share!